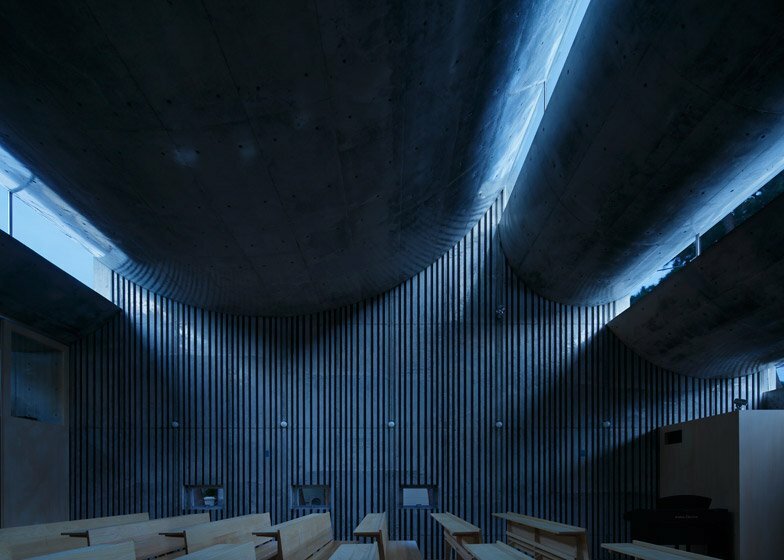 Gaps in the upside-down barrel-vaulted ceiling of this Japanese church by Takeshi Hosaka funnel slices of light into the concrete-lined hall (+ slideshow). 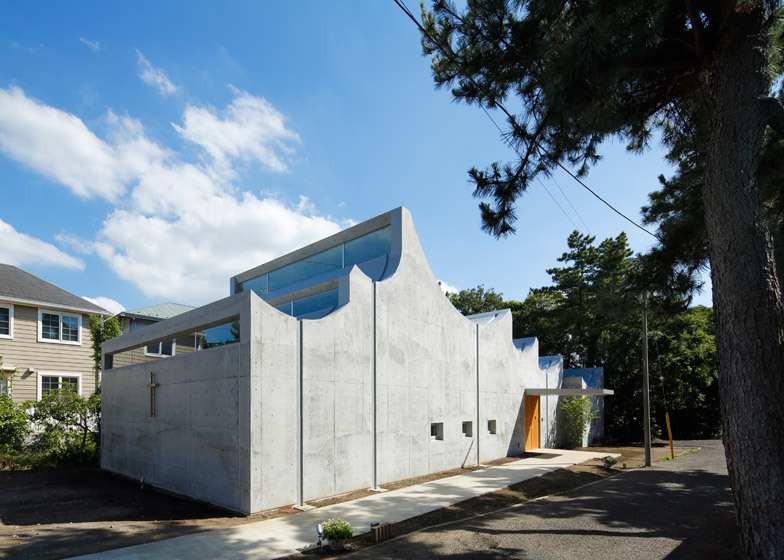 Takeshi Hosaka designed the 175-square-metre Shonan Christ Church for a site along the coast of Sagami Bay in Kanagawa Prefecture, Japan. 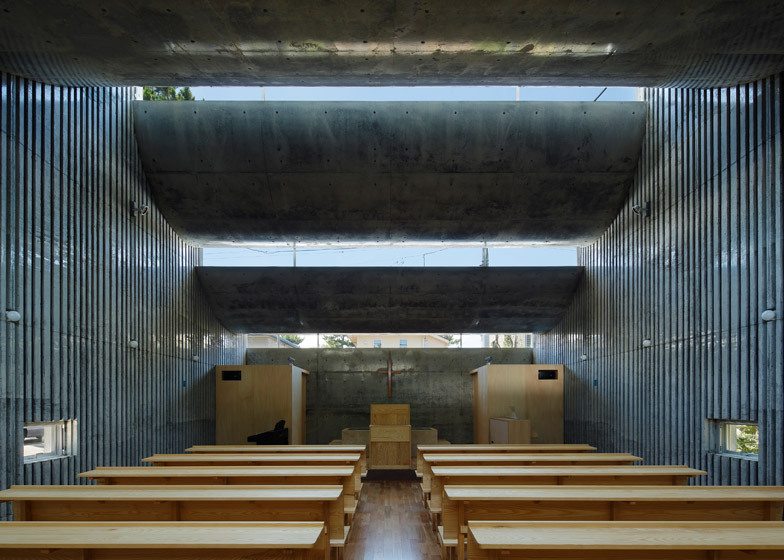 The "restrained" single-storey height of the church, with a sculptural reinforced concrete roof, is intended to harmonise with the low-rise buildings of the residential area. 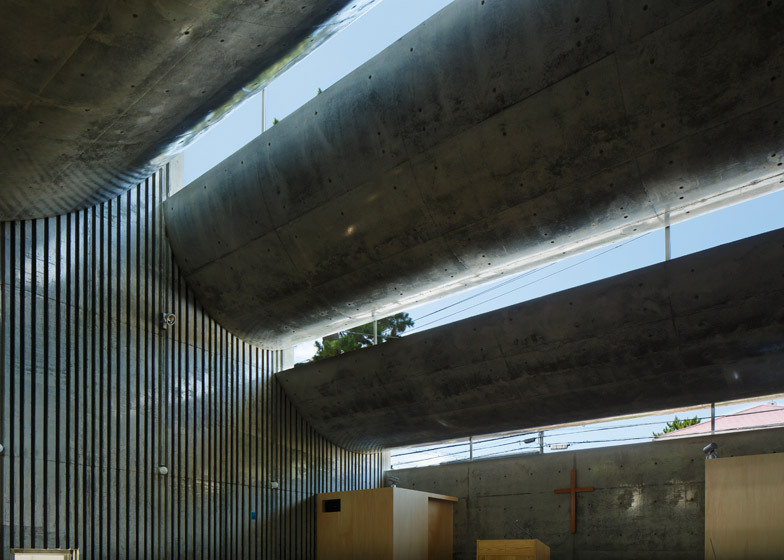 This curving cast-concrete roof features six separate concave slabs, intended to symbolise the first to sixth day in the Bible's story of creation. 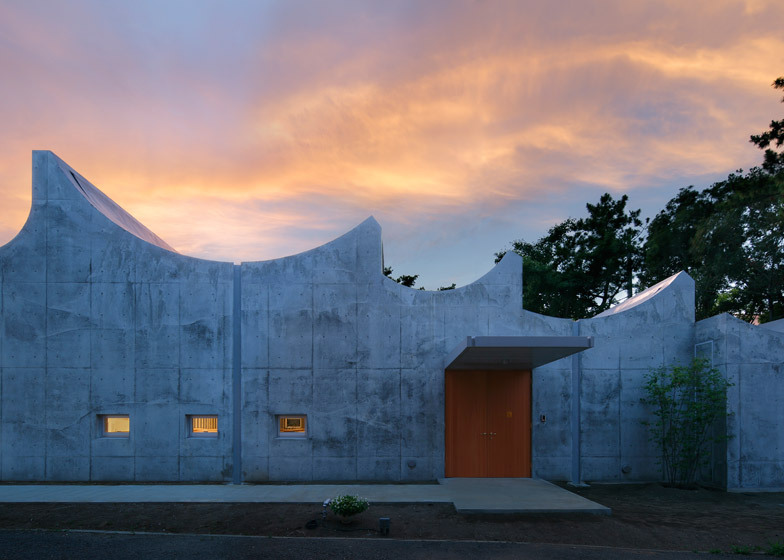 "The characteristic six curved slabs are designed not only for architectural reasons but also they provide structural, acoustic, and lighting benefits," said the architect, whose past projects include an igloo-like noodle restaurant near Mount Fuji. 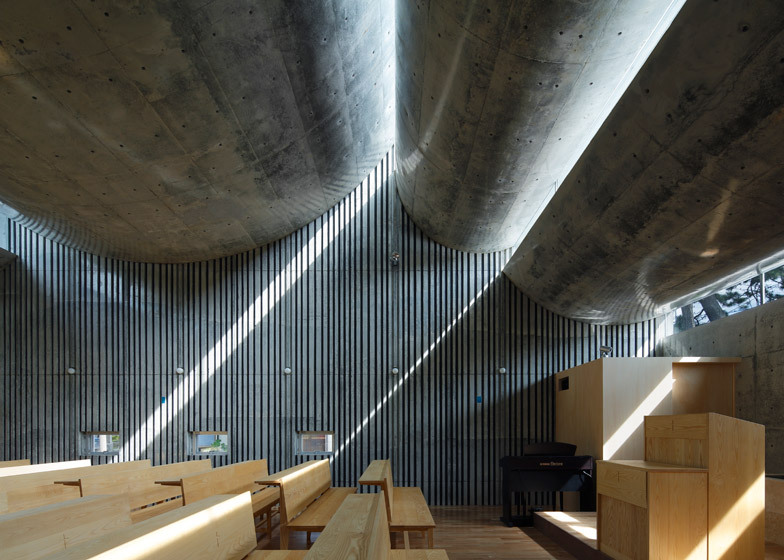 Strips of glazing inserted in gaps between the roof slabs angle slivers of sunlight into the church hall. The number of sun beams changes as the day progresses, with a single beam at noon heralding the end of the typical church service. "Direct sunlight was inappropriate for the time of the service. 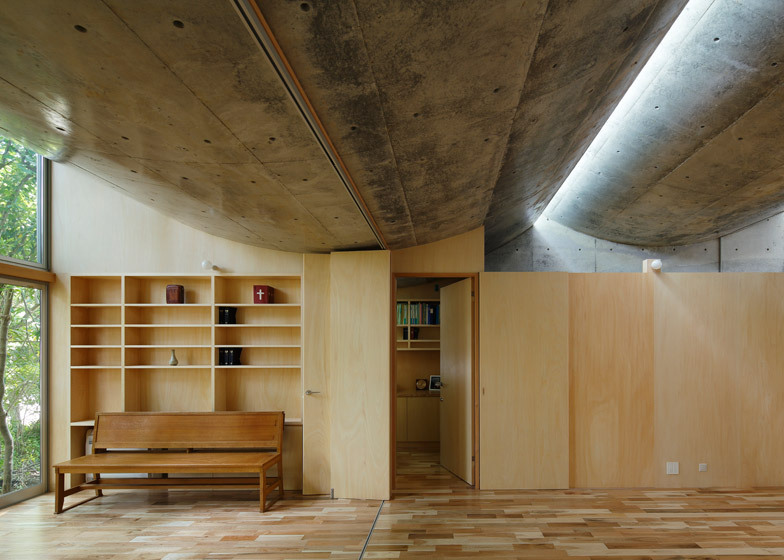 This construction was designed to create a space of skylight during the time zone for the service – 10:30 until 12:00 on Sunday morning – and direct sunlight during other time zones," said Hosaka. 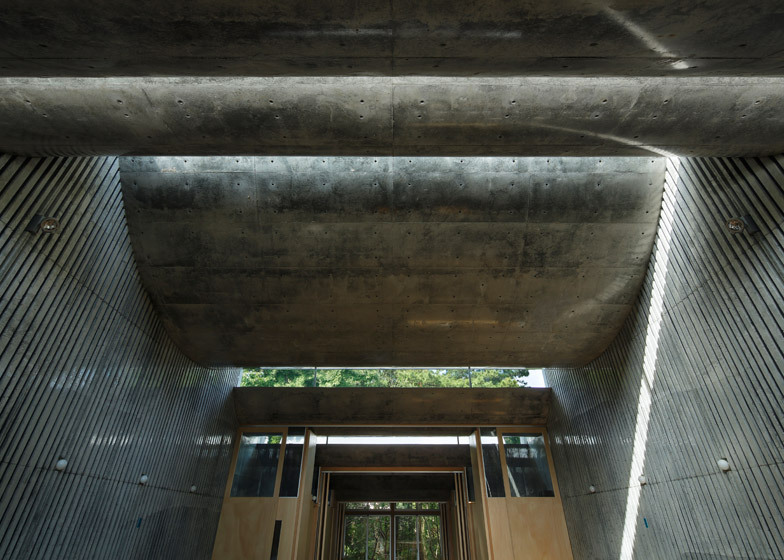 "If the service comes close to the finishing time, direct sunlight begins to draw a ray of light on the wall surface." Each of the curved panels has a span of 7.5 metres and a thickness of 25 centimetres. 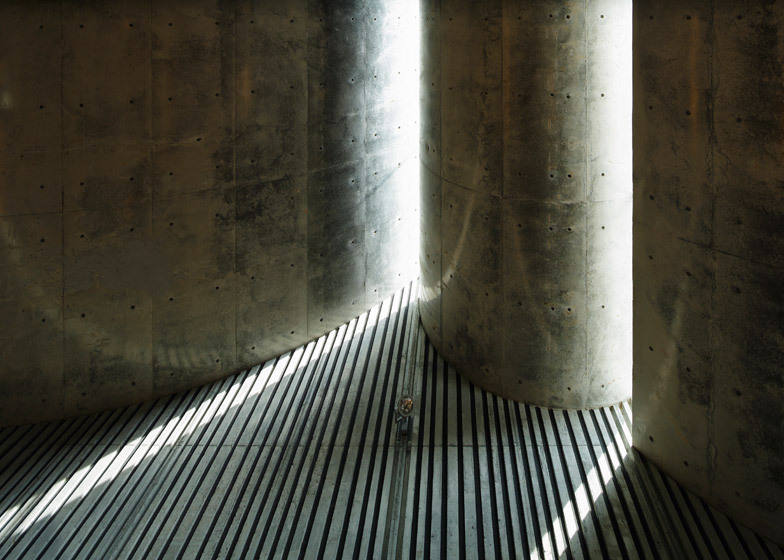 Described by the architect as "void tubes", they appear solid from inside the building. 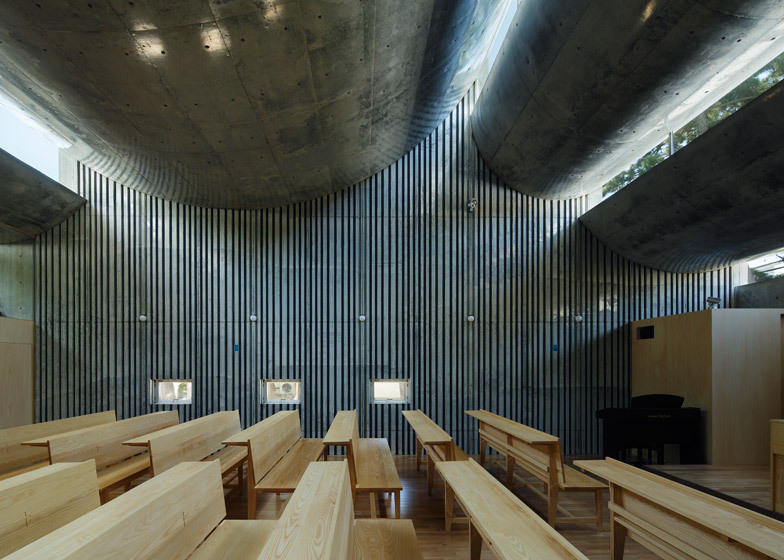 The shape of the roof was also designed to dampen and reflect the sound of hymns, and to ensure sermons can be heard clearly by the congregation. 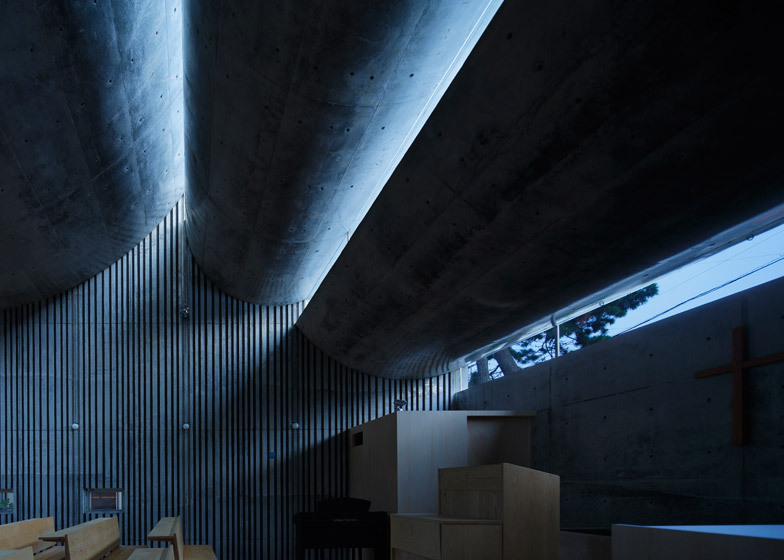 Vertical grooves carved into the sheer concrete walls aim to provide further sound absorption. 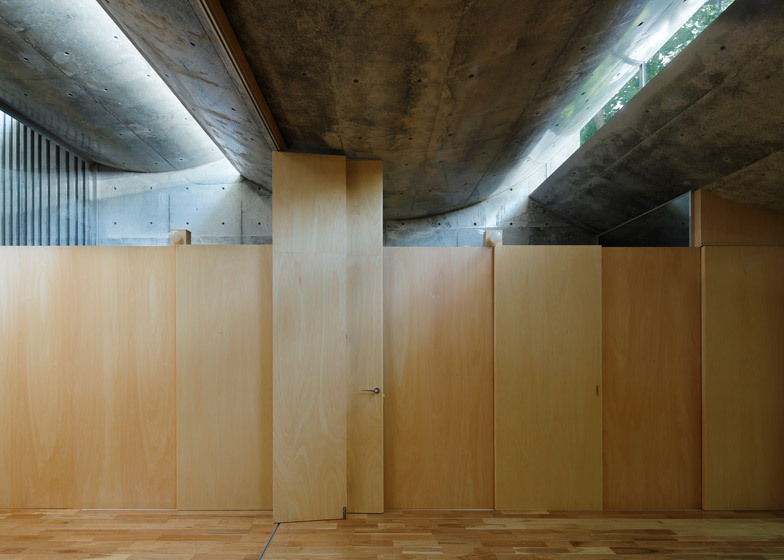 Strips of dark grey urethane foam inserted in the gaps help to avoid "undesirable echoes." 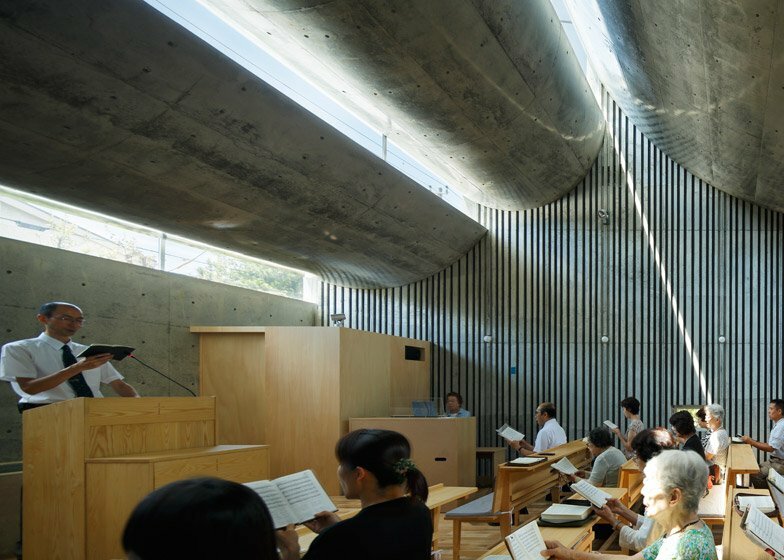 "In the sanctuary, the pastor's speeches can be heard clearly and easily throughout the space, while the hymns can be heard softly," said senior consultant at Nagata Acoustics, Ayako Hakozaki. 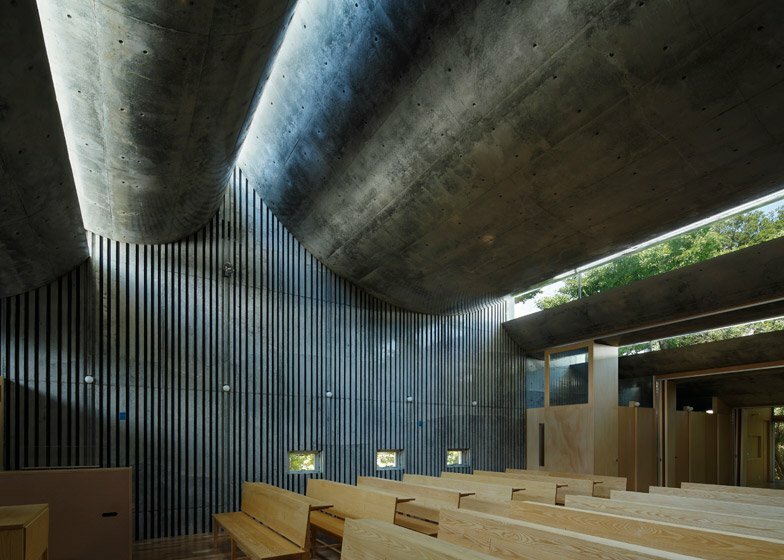 Rows of simple wooden pews provide seating, and a small cross to the rear of the pulpit and baptismal pool is aligned with the concrete panelling. 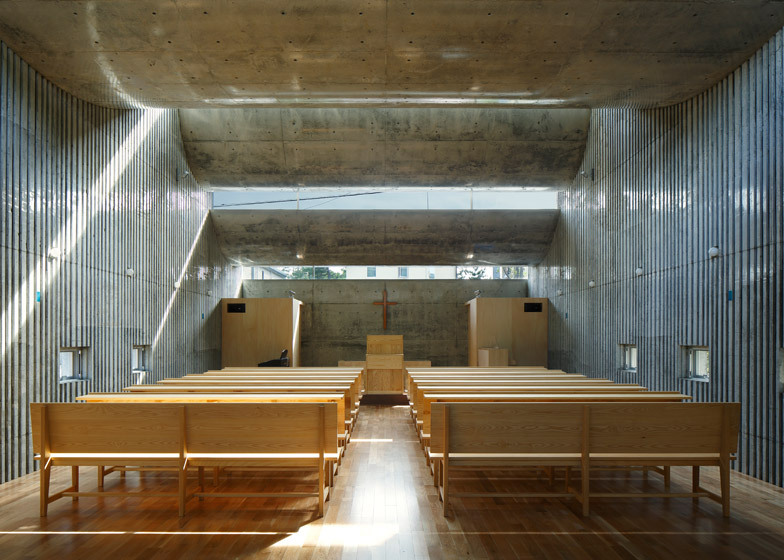 Low-level rectangular windows on either side of the pews allow views to the outside for those seated. 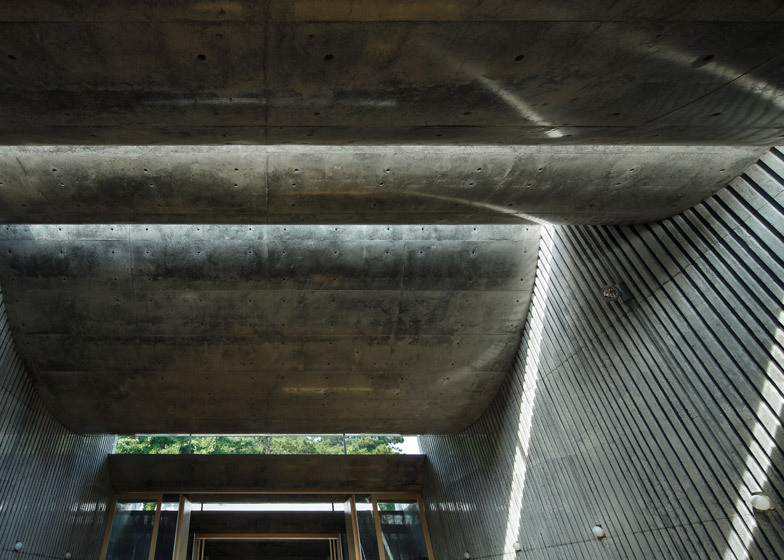 Thick furrows in the smooth exterior walls of the building channel rain water from the deepest part of the curvature of the rooftop bays to prevent the inconvenience of blocked gutters and create a water feature in wet weather. A terracotta cross fixed to the adjacent facade is made from sand collected by the minister from the site of the old church. 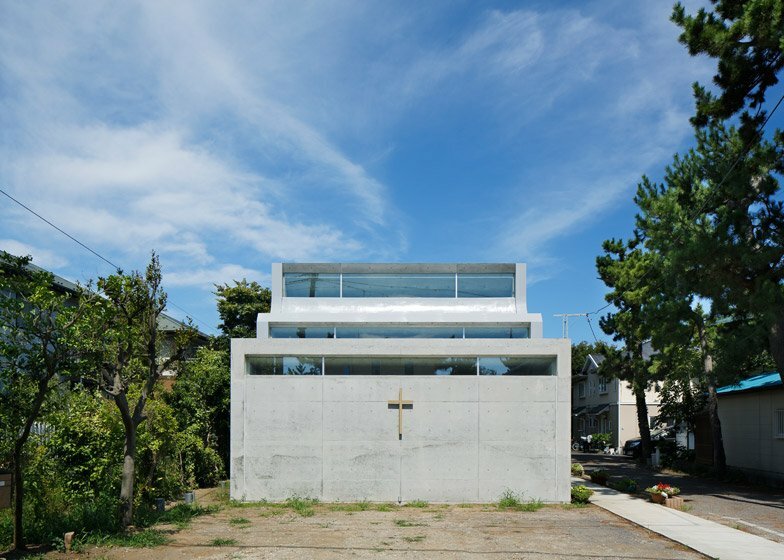 "I wanted to interweave the 50 years' history of Shonan Christianity association and the congregation's desires in it," said Hosaka. 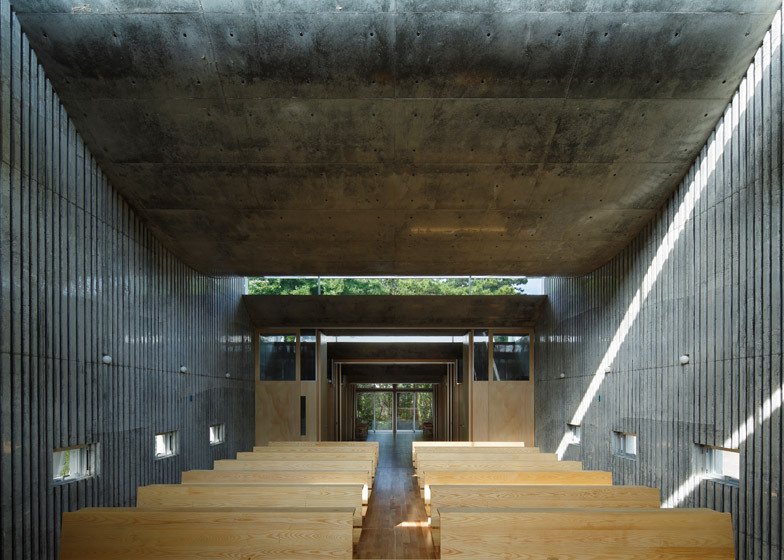 A large concrete pier extends out of the facade above the wooden doorway to the church, forming a porch where the congregation can gather. 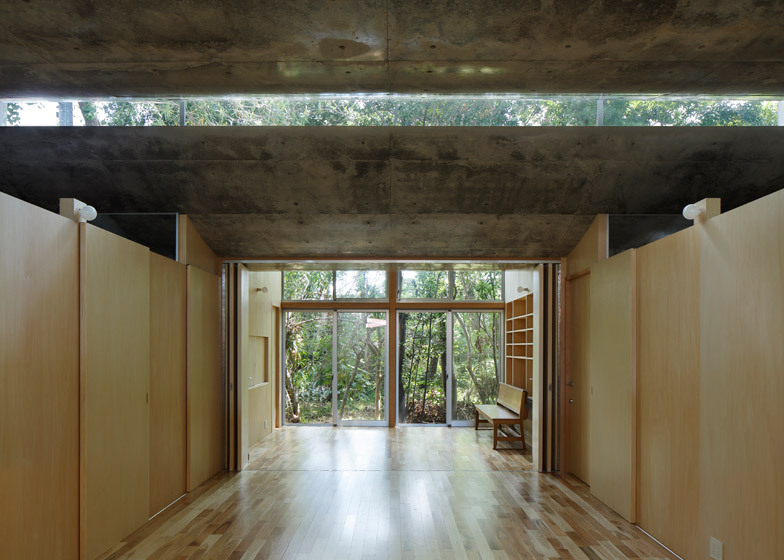 To the right of the entrance lobby, a series of pale wood-lined compartments house meeting and storage rooms, a kitchen and toilets. 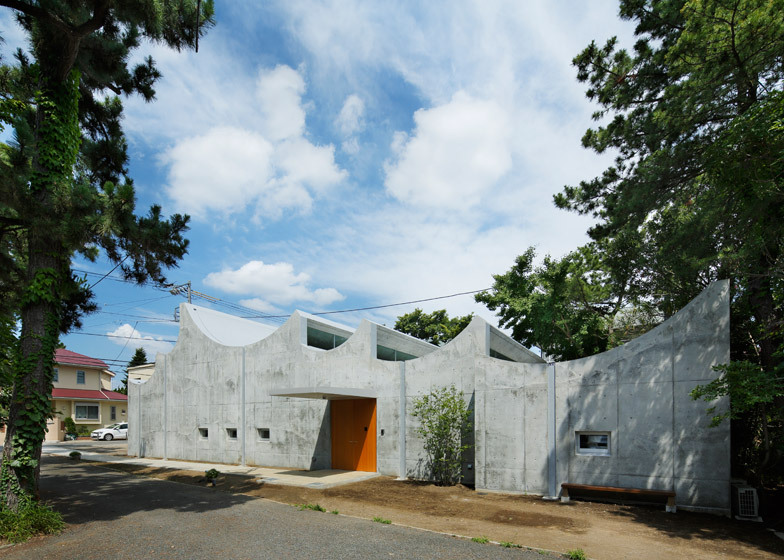 Photography is by Koji Fujii / Nacasa & Partners.